Great source for envelopes. They carry glassine and star dream among others. Source for clear bags to package cards in. Also carry handmade paper. Pressed flowers, metal embellishments and other goodies. 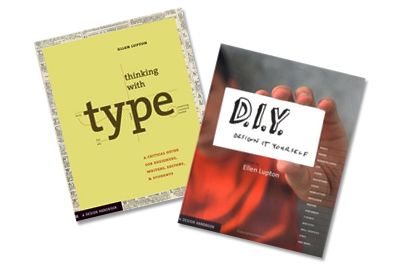 I love this Thinking with Type book by Ellen Lupton... it is a great resource for understanding how to use typography, and it is a quick easy read with lots of insight. I remember when I bought it I was flipping through a bunch of books on typography, and this one was the only one that went into the Golden Section, so this is the one I bought. The other day at Sw pe in Toronto I saw that Ellen Lupton edited a new book, D.I.Y Design It Yourself and I had to get it. It is also a quick read and has tons of great ideas and project starters... everything from how to design a press kit to t-shirts. If you get a chance, check these babies out. If you are looking for something to do, visit Ellen Lupton's site. She has a ton of great links and even offers free advice! thanks for the book tips! Especially d.i.y. sounds something I need to get. Shop Early for 2008 Calendars! Look out Canada, here come the Neveaus! Every thing cool, all in one place! Inspiration for handmade goods of all kinds.